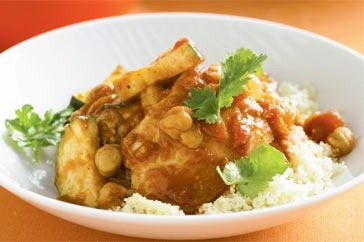 Chicken Tagine is North African dish and it is cooked in very low heat with different herbs and dry fruits. The traditional method is to cook it on coals but we will cook it on stove. The word tagine refers to both the conical-shaped dish and the food that’s cooked inside it, which is usually a blend of delicious sweet and savoury flavours. Heat oil in a pan, fry onions till it changes color. Then add chicken pieces. Fry chicken till it turns light golden in color. Add carrots, tomatoes, zaatar, tawabil, honey, salt, figs, raisins and dried apricots to the pan and cover it with lid. Cook for 20 minutes over low flame and then turn off the flame.